While sifting through words to describe Stefan Kac (pronounced "cats"), I opened an email from trumpeter Dan Frankowski to find that he had already done the work for me. Frankowski called Kac "an intense, brooding, mercurial, funny, and passionate composer, tuba player, and thinker." At 27, Kac has one foot in jazz and the other in classical music. In 2005, he was accepted to the Betty Carter's Jazz Ahead residency program at the John F. Kennedy Center for the Performing Arts in Washington, D.C. -- the first tuba player ever to make the cut. He has performed and recorded with the Pan-Metropolitan Trio and the sextet Ingo Bethke. He's an avid part of Milo Fine's circle of improvising musicians and a member of BroncoVision; in March, he played with pianist Bryan Nichols' We Are Many project at MacPhail. As a classical artist, Kac was a finalist in the Minnesota Orchestra's 2005 WAMSO Young Artist Competition. 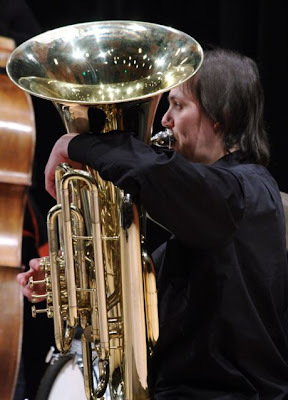 He holds the tuba chair in the Copper Street Brass Quintet, a touring and educational group that is artist-in-residence at Hennepin Avenue United Methodist Church. He also teaches low brass at the West Bank School of Music. Most recently, Kac formed the Symphonic Transients Orchestra, a large instrumental ensemble of flexible instrumentation that performs original compositions -- part contemporary classical, part jazz. Born in the Twin Cities, Kac hated music until age 11, when he was given a choice that must have seemed lose-lose at the time: join either the school band or the choir. He first took up the euphonium, the tuba's smaller cousin, and then switched to the tuba in ninth grade. In 2005, he received a Bachelor of Music in Tuba Performance degree from the University of Minnesota. Musical achievement aside, for the first 19 years of his life, baseball was Kac's real priority. As a student, he once hit against a young pitcher named Joe Mauer. "I'm a .500 lifetime hitter against Mauer," he says. "One for two -- not bad." Pamela Espeland: What obstacles have you encountered because of the instrument you play? Stefan Kac: Not as many as you'd think. The obstacles I've faced have been in formal, academic settings. I can't think of one example from the so-called real world where it has held me back or where I've lost out on something because of it. The novelty [of the instrument], and the expectations of what the tuba is traditionally asked to do, and what it is actually capable of doing, work in my favor. PLE: The tuba used to be more common in jazz. What happened? SK: The textbook version of what happened is that the Chicago style of jazz took over. The bass took over the tuba, and bands were playing indoors instead of outdoors, so they didn't need a bass instrument to project over a football-field-size space. There's been kind of a revolution in tuba playing within the last 40 years -- not just in jazz, but also in classical music. The level of playing right now is absurdly far ahead of what it was two generations ago. PLE: Have you ever been tempted to stray -- to play another instrument? SK: All the time. I'm tempted by the piano. I'm fascinated with the clarinet and the viola. I feel there's a lot locked inside of me that I can't get out through the tuba. I'm not going to sit here and claim that [the tuba] is just like a saxophone, because it's not. You can do things the saxophone can't do, in terms of the richness of the sound, and the range -- the dynamic range is huge -- but you can't do everything. I would love to have chops on a more facile instrument. I've never thought of myself as just a tuba player. I was a tuba major in college, and it was my job to get better at playing tuba. Once I got away from that, I remembered what I had known years earlier: I'm not just a tuba player. I'm a composer. I'm a listener. PLE: When did you first become interested in improvisation? SK: I joined a group in 2003 led by [drummer] Nick Zielinski called Tanya and the Holsum Family Fiscal Planner [later Brenda and the Holsum Family Fiscal Planner]. It was a large improvising group that he conducted, about 11-12 people. I was in my third year of college, playing a lot of jazz and classical. I had never played free. Joining Nick's group introduced me to that. PLE: What was it like? SK: Equal parts scary and exhilarating. I knew pretty quickly that I had stumbled on to something that was going to become more important to me.... As most jazz players do, I had trained myself to play in that style. It never occurred to me until then that I might want to improvise in another style. PLE: What do you mean by "in that style"? SK: Taking tunes and solos, material from famous recordings and famous players, and imitating them. Taking phrases and licks from people like Charlie Parker, John Coltrane, and Miles Davis, practicing them a lot, and trying to use those licks the way they used them. The way jazz is taught is that you take someone else's stuff and play it. Rarely do you stumble on a teacher -- and it's difficult to do this as a teacher -- who teaches improvisation as improvisation rather than style. And I was happy [playing in that more traditional jazz style] for a long time. It took joining Nick's group to break everything open. PLE: How do you define improvisation? SK: I'll have to steal Milo's [Milo Fine's] definition. He calls it "instant composing." My only caveat to that is that traditional composition is well-suited to yield certain results, and improvisation is well-suited to yield other, different results. If you sit down with a string quartet, and someone says, "Why don't you guys improvise something in the style of a Haydn string quartet?" you're talking about very minutely, closely organized harmonic motion. It's really hard to improvise harmonically with other people when you don't know what the chords are. PLE: When you're playing free, do you know what the chords are? SK: No. This isn't to say that free improvisation doesn't involve harmonic motion; it does. But it doesn't involve the same kind of harmonic motion that Haydn would involve. Also, when you compose for a string quartet, you control the entire group. [When you're improvising], you can only control yourself and your part.... I've heard composers say, "You could never improvise a piece as well as a great composer could compose a piece." I don't agree with that at all. I agree that you could never improvise a piece and have it sound like it was composed. It's going to sound like it was improvised. I'm not saying that's better or worse; it's a different set of parameters yielding a different result. If that's not the result you want, you're working in the wrong medium. PLE: What happens when you and Milo Fine and Davu Seru or whoever sit down and start to play? SK: The first thing that happens is someone, or a group of someones, has to decide to start. To me, that's the hardest part. You know the Miles Davis quote, "If you don't know what to do, do nothing." That's kind of my philosophy in that situation. It's never in doubt that someone will start. And once there's sound, you're composing in real time. I grew up composing with notation, ostensibly in a classical musical style and tradition. I'm cognizant of the fact that I can't control the other people, and I don't know what they're going to do before they do it, but I can listen, and I can react, and I can compose my part to this symphony that's going on around me. PLE: Are you seeing notes? SK: There's no visual aspect to improvisation for me. I'm thinking about what should happen next; occasionally, there's something technical, in terms of playing. You hope to keep those things in your subconscious, though, because it's tough to keep up if you're thinking about technique. PLE: Does time speed up or slow down when you're playing? What is your sense of time? SK: I think I have a tendency for time to speed up, which isn't always a good thing.... When I played baseball, I was an in-fielder for most of that time. When a ground ball would be hit to me, I would almost black out, because after I had thrown the ball, and it was in the first baseman's glove, and the guy was out and the play was over, I wouldn't remember what had just happened. It was almost trancelike. That happens from time to time in playing, too. It's hard to trust that, though. I still rely a lot on the conscious part of my brain -- probably more than I should, probably more than a lot of other players do, but that's kind of who I am, for better or worse. I'm not the kind of person who leaves things to chance. PLE: Are you pre-hearing or trying to predict what the others will do? SK: I'm tempted to anticipate, but when you do that, you're always wrong. And if you're not wrong a lot, then you need to play with some new people and get out more. PLE: How do you know when it's working? SK: That's completely subjective. Different musicians in the group sometimes don't agree on that. If the people in your group aren't agreeing on that, you're probably with the wrong group. PLE: It seems as if playing free would be energizing and enervating at the same time. SK: I find it mentally exhausting. At the end of those Homewood things [free jazz performances at Homewood Studios in North Minneapolis], my head is spinning. That's not to say that I don't have fun. Of course I have fun, but I feel a significant sense of responsibility that I don't feel as much elsewhere. It's not just about executing the part on your page perfectly; it's about making up a part. What if something cool is going on, and I ruin it? That's not the kind of thing that should be going through your mind, but it's always there for me. So, it's actually more of a burden than a lot of other situations. PLE: Many people seem to think they have to understand jazz before they can enjoy it. They don't say, "Before I go to a classical concert, I have to understand Bach." SK: They do [say that about classical music], but it's definitely worse with jazz. I've never liked the word "understand" applied to music. I don't think that liking something has to do with understanding it or not understanding it. It's hard even to define what "understanding" would mean in this case. You could apply it technically -- to the theory behind the music. But there are people who don't read music, don't know theory, never studied formally, never played an instrument, and somehow they're able to enjoy those kinds of music. That, I think, is a pretty obvious argument that "understand" is not the right word.... We probably won't ever be able to reason our way into aesthetic judgments. That would be a total contradiction of what art is, what aesthetics are, and how we function. PLE: What advice would you give to someone who's thinking about going to one of your free jazz performances? SK: First of all, the sound is the important part. And I mean that as opposed to the visual part, the rebellious we're-just-going-to-do-what-we-want-to part. It's a piece of music. It's a concert. Focus on the sound, in spite of everything else that might be different about it. Second, don't expect it to do what other kinds of music do. PLE: What should people expect? SK: The cliché would be "Expect anything!" and theoretically, anything could happen. Obviously, depending on the [performers], not absolutely anything could happen, because people have their things they do -- their approaches, their experiences. PLE: People often have negative expectations of free jazz. Noise, cacophony, disorganization, shrieking. SK: If they're expecting shrieks and wails and farting sounds, assuming they view those things negatively, they're probably going to have a better time than if they're expecting glorious celestial harmonies.... Most really good, accomplished free playing doesn't just shriek and wail. There's a lot more to it. That's why people will be pleasantly surprised. PLE: What are you listening to these days? SK: I haven't been listening to much jazz lately; I'm almost entirely listening to classical music. Every now and then, I stumble on a progressive rock band I really like -- a lot of those bands were heavily influenced by jazz. I can tell you who has influenced me in jazz: Wayne Shorter, Miles Davis. Miles Smiles was one of the very first jazz albums I listened to. Monk: I've been listening to Monk because I'm still working through that Robin Kelly biography [Thelonious Monk: The Life and Times of an American Original]. My dad gave it to me for Christmas. I'm like, "Thanks, Dad, I can't even lift this thing." PLE: You're comfortable in a number of different worlds that don't always get along, like classical and jazz. SK: I don't go out of my way to be eclectic. I have legitimate interests in a couple of different areas, and most people tend not to be like that. Classical musicians are not known for their eclecticism. Jazz musicians are jazz-centric. Trying to straddle different groups like that is difficult. Not musically or artistically, but socially.... I'm finding balance to be an important and tricky issue. But if I had to do just one of the things I'm doing and couldn't do the others, I'd be really unhappy. Originally published on mnartists.org on June 2, 2010. mnartists.org is a project of the Walker Art Center and the McKnight Foundation. 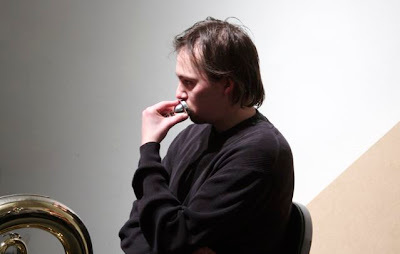 Learn more about Stefan Kac, hear selections from his music, and view scores at his website.